Anyone who has ever been in the Netherlands for New Year’s Eve (Oud en Nieuw) has experienced the outstanding, impressive spectacle of fireworks in the sky. Starting from early in the morning on the 31st of December, they can be heard and seen all over the country, getting more and more grandiose closer to midnight. Because of the festive atmosphere that they are supposed to create, very often fireworks are being ignited by regular people on the streets, close to the houses, cars, municipal buildings and other property. This way of celebrating the end of the old year and the beginning of the new one is, obviously, very dangerous. Especially when performed by young kids – which happens needlessly very often. It may easily go wrong and create a potential threat not only for the person who lights up the firework, but also for the people around. This year is, sadly, no exception. The figures given by the emergency rooms, the police and fire departments are not very optimistic. For instance, according to the information from the Rotterdam Eye Hospital, this year at least 14 people were reported to have become victims of fireworks with serious consequences and permanent damage. This can mean reduced or limited vision, complete blindness or eye removal. On the New Year’s Eve itself there were three operations performed to repair the damage caused to eyes by fireworks, five people permanently lost their eye. The ophthalmologists say that these are preliminary numbers, as every year with a course of time there turns out to be more complications than originally expected. And even though none of these victims were children, half of them were just bystanders who didn’t participate directly in lighting up the fireworks. None of the victims wore protective glasses. 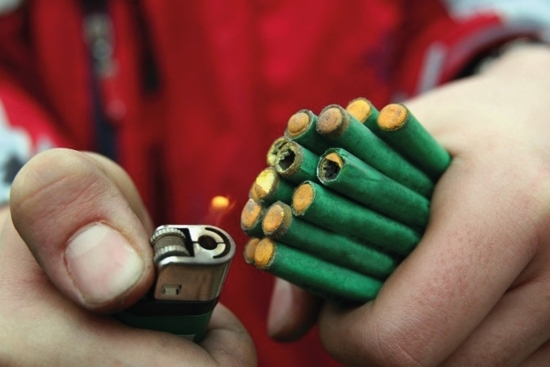 In addition to eye damage, fireworks often result in burns and hand injuries. Plastic surgeons had to resort to quite a few hand and finger amputations this year. In general, injuries and traumas this year were noticeably worse compared to the past. Among them the doctors name such life-threatening conditions as open bone fractures, severe burns and lacerations, serious facial injuries and severe brain damage. 30 percent of the victims had to be operated the same night or the next day and at least 30 percent of the injured will probably have the damage for the rest of their lives. 33 children received wounds because of the fireworks misuse. One person died while lighting up firework next to his house. The 39-year-old man from Swifterbant was trying to ignite an illegal firework called mortar that exploded almost immediately at the moment of discharge. The explosion became fatal. The man’s wife and children were witnesses of the accident. A few times fireworks were used as a weapon against the police and the fire brigades during their attempts to extinguish fire or against the arrests. The fireworks were thrown by young people directly at the officers or at their cars. As a result, a few policemen were seriously injured. According to the officials, half of the fireworks used were illegal. Even though the number of accidents this year was slightly lower than the year before, the injuries received were a lot more dangerous. The Dutch Ophthalmic Society (Nederlands Oogheelkundig Gezelschap), together with a few other organizations, is calling for a ban on consumer fireworks and proposes to organize professional firework shows instead. They created a manifesto, through which they hope to persuade the politicians to implement such ban by 2020.